Retinal glial cells acting as optical fibers shuttle longer wavelengths of light to individual cones. 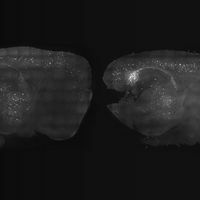 A.M. Labin et al., “Müller cells separate between wavelengths to improve day vision with minimal effect upon night vision,” Nat Comm, 5:4319, 2014. Our eyes, like those of most vertebrates, are layered counterintuitively, with light-receiving rod and cone cells at the back of the retina and neurons and glial cells stacked in front. Theoretically, this inverted structure—five layers deep—should result in blurry vision, given that light must propagate through all the reflecting and scattering cell layers before triggering the photoreceptors. Yet a normal eye forms images clearly. 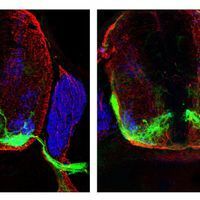 A 2007 study led by Kristian Franze, now of the University of Cambridge, found that one kind of retinal glia, known as Müller cells, resolved the problem by functioning as optical fibers, channeling light to the buried photoreceptors. Still unanswered was: How did these natural optical fibers support two different kinds of photoreceptors—rods, which function in low-light conditions, and cones, which help us see in bright daylight? 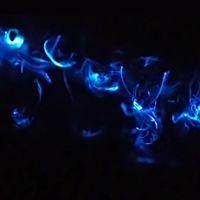 Based on Müller cells’ refractive index (how much they bend light), diameter, and other properties, Amichai Labin of Technion—Israel Institute of Technology in Haifa and his colleagues simulated how the cells might work as optical fibers. 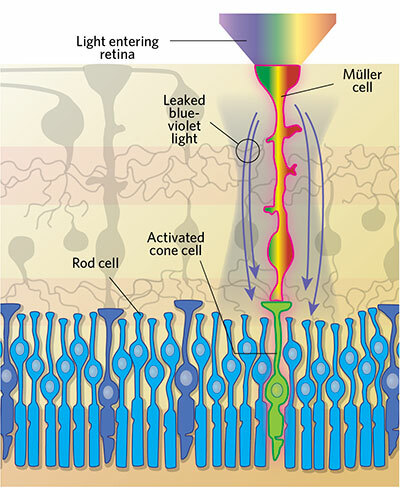 They found that Müller cells struck with white light concentrated wavelengths in the green-red spectrum—a range overlapping greatly with the absorbance spectra of two types of cone cells, and, to a lesser degree, with a third cone type—while blue-violet light leaked out, diffusing through the retina to activate rods. The Müller cells’ maximal light concentration occurred in the green-yellow part of the light spectrum at a wavelength of 560 nm, which happens to be the wavelength one cone cell type is most sensitive to. “The next question was, if they’re guiding mainly green light, where are they directing it?” asks Labin. 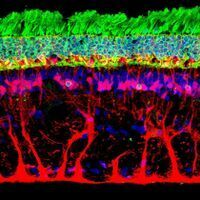 Zooming in on guinea pig retinas under a confocal microscope, the researchers found that each Müller cell was coupled to an individual cone photoreceptor, and that nearly 90 percent of all cone cells were linked to Müller cells. The optical-fiber effect could increase the number of photons reaching a single cone cell nearly 11-fold at its peak concentrating power, but had only a minimal effect on the light reaching rod cells.